Of course, all National Parks are beautiful. They’re all full of natural wonders, rich landscapes, and diverse wildlife. Yes, they’re all beautiful, but Maine National Parks just might have an upper hand. Acadia National Park Maine is proof of that. It’s situated primarily on Mount Desert Island off the coast of Maine, as well as on a few smaller adjoining islands. It has a sprawling shoreline and a rich New England forest. Acadia National Park weather is mostly moderate. The air is crisp and the list of activities to do is long. A quick glance at an Acadia National Park map reveals just part of why the park is so alluring. You get the best of both worlds. You get adventures on land, and on sea. You get to behold the beauty and power of the ocean’s waves, and the stately beautify of a fir-lined forest. Over three million people have visited Acadia National Park, and it’s time to add your name to that list. You just want to make sure that you make the most of your visit. With so many sites to see, and so many activities available, you want to make sure you come prepared, informed, and educated. To do that, you need to know the best things to do in Acadia National Park. Here are the top five things to do on your visit. 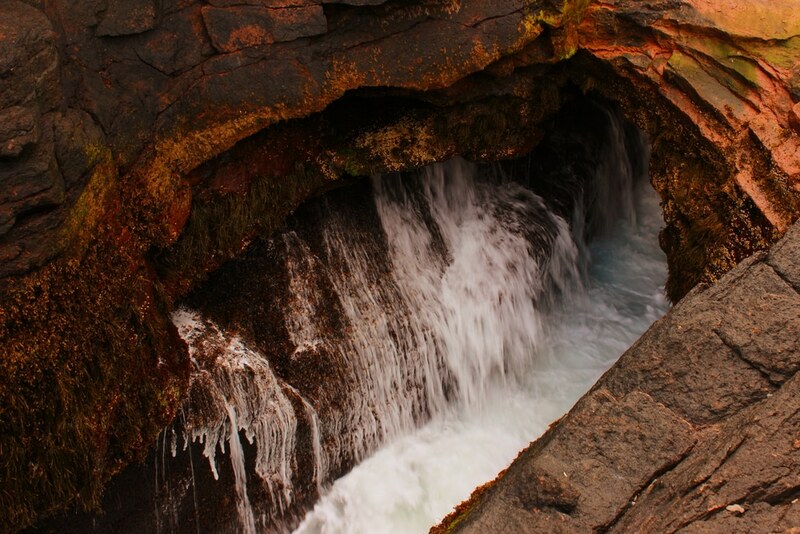 Thunder Hole Acadia is the place to go to experience the raw power of the sea. Over time, waves have naturally carved a small inlet into the rocky coastline. When powerful waves fill the inlet with water, the force of the water and air against the rocks sounds like a clap of thunder. It also sends water up to forty feet into the air. You can park nearby, at Sand Beach, and take the three-mile round trip trail on Ocean Path. You’ll get a beautiful, up-close view of Maine’s shoreline, and at the end of it, you’ll get to experience first hand the power of the ocean. Watch out for the waves, and hold onto your hat and your cell phone. The same Ocean Path trail that can take you to Thunder Hole, can also lead you to Otter Cliff. It is one of the most recognizable locations inside Acadia National Park, and it is also one of the tallest coastal headlands in America. Its craggy rock formation juts out sharply into the sea. The cliff is rugged, and aggressive, but the beach below is covered in round rocks that look like delicate little pebbles. You’ll find plenty of places to wander, and plenty of things to photograph during your trip to Acadia, but make sure that one of them is Otter Cliff. Cadillac mountain, located on Mount Desert Island, is the highest peak on the North Atlantic Seaboard, and from October 7th through March 6th, it is the first place in the United States to see the sun rise. A scenic highway winds its way up the mountain with several overlooks along the way, making it an easy place to get beautiful views. You can get a picture perfect view of the surrounding landscape, and snap a great photo of the sunrise before anyone else in America sees it. Sure, it’s just a sunrise, and it happens everyday, but there’s something a little special in knowing you got to see it first. It’s tempting when you visit a national park to balance the rustic wilderness with the creature comforts of a hotel room. At the end of a long day spent hiking, biking, and sightseeing, it’s only natural to want to collapse into a plush king sized bed. If you can subdue that urge, the chance to enjoy Acadia National Park camping is even more alluring. Camping helps make the wilderness real. You can hike and bike all you want through it, but you can’t really experience nature without spending at least one night out in it. You have to hear the rustle of the tree branches outside your tent, and the sounds of the birds in the early morning. The shoreline of Acadia Park demands to be experienced in an up-close and personal way. There’s no better way to do that than by kayaking around it. You’ll get amazing views of the rocky shoreline, the pebble beaches, and the tall pines. Acadia National Park trails are a great way to experience the untamed wildlife of the park, but they can make it hard to really fathom the size and scope of the place. You can’t always see the forest for the trees, but a trip on the water can solve all of that. It’s hard to pick from the dozens of activities and sights that Acadia National Park has to offer, but now you can be confident that you have a good place to start. You have a good list of must-sees to work from, and you’ll find plenty to help fill in the gaps.